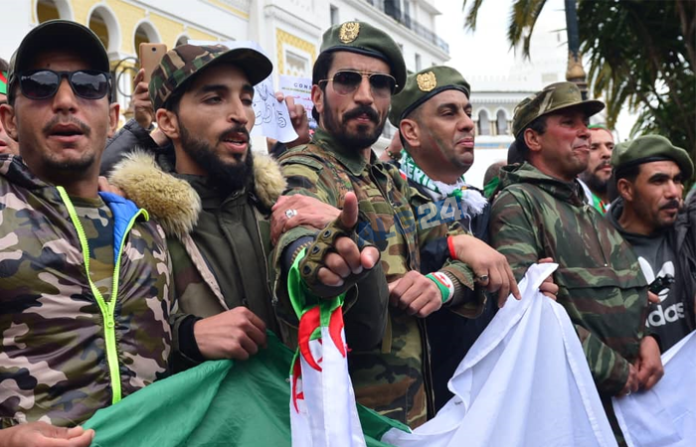 Algerian protesters reject the presidential election plan, demanding the departure of all men of the regime, including the interim president, prime minister, and the army chief. لم تبرد حرارة الجزائريين للخروج إلى الشارع في جمعة أمس والدعوة لتحقيق كافة المطالب الداعية إلى التغيير الجذري للنظام ورحيل كافة رموزه من الواجهة، رغم دخول الحراك الشعبي أسبوعه الثامن. وعبّر الجزائريون بصوت عال في كل المسيرات التي جابت مختلف ولايات الوطن عن رفضهم اعتماد ما تنص عليه المادة 102 كطريق وحيد لإدارة هذه المرحلة، ودعوا إلى اعتماد حل سياسي بديل يخلص الجزائريين من شبح “الباءات الثلاثة” الذين مازالوا يديرون مؤسسات البلاد، على رأسهم الوافد الجديد إلى قصر المرادية، عبد القادر بن صالح. ولم تخل مسيرات الجزائريين من علامات استفهام حول موقف رئيس أركان الجيش الذي دعا، في خطابه الأخير، إلى عدم الاستمرار في التظاهر. وطالب متظاهرون بشكل لافت الفريق ڤايد صالح بالرحيل، معتبرين أنه من المجموعة المعنية بشعار “يتنحاو ڤاع”، وهي المرة الأولى التي تخرج فيها دعوات صريحة من هذا النوع. وسُمع في قلب الجزائر العاصمة هتاف “يا بن صالح أدي معاك ڤايد صالح”، في إشارة إلى عدم رضا المتظاهرين عن مضمون الخطاب الأخير للفريق. Head of the State Abdul Qdir Ben Salih has summoned the Electorate for the presidential elections on 4 July 2019, setting in motion the process which will allow to fill the institutional vacuum resulting from resignation of President Abdelaziz Bouteflika. President Bouteflika handed his resignation on April 2 after several weeks of protests firmly opposing the 5th term or the extension of his 4th term which was to expire on 28 April. The convening of the Electorate comes in the wake of the meeting of the two Houses of the Parliament to take note of the definitive vacancy of the post of president of the Republic, in application of the Article 102 of the Constitution. Pursuant to the Article 102 of the Constitution, Speaker of the Council of the Nation takes office as Head of the State for a period of 90 days. In a speech, Head of the State Abdelkader Bensalah, on Tuesday in Algiers committed to set up, in consultation with the political and civil class, “a national collegial and sovereign institution, which will be responsible for preparing and organizing national fair and transparent elections. The Chief of Staff of People’s National Army (ANP), Lieutenant General Ahmed Gaid Salah, once again used the word “gang” to describe businessmen involved in corruption cases. “We reassure public opinion that we will reopen previous files, such as; the cases of El Khalifa, Sonatrach and Boucher or “the butcher” , and other files relating to corruption that have caused considerable losses to the Public Treasury, “said Ahmed Gaïd Salah in his speech on the sidelines of the working and inspection visit in the 2nd Military Region. This Friday, April, 12th, marks the 8th Act of anti-regime demonstrations. After three contests against the candidacy of Abdelaziz Bouteflika for a fifth presidential term, the head of state responded favorably by giving up his candidacy and postponing indefinitely the presidential election that was scheduled for April 18. Earlier, the sixth act of the “Hirak” was marked above all by an unexpected position of the National People’s Army, announced by the Chief of Staff, Lieutenant-General Ahmed Gaïd Salah, who called for the application of the Article 102 of the Constitution, dismissing the President of the Republic on the grounds of illness. Later, the outgoing President Bouteflika officially notified to president of the Constitutional Council his decision to end his mandate as President of the Republic. Subsequently, both houses of Parliament (the Council of the Nation and the People’s National Assembly), sitting together Tuesday, in Algiers, took note of the Constitutional Council’s declaration of the permanent vacancy of the post of president of the Republic, following the resignation of Abdelaziz Bouteflika. The speaker of the Council of the Nation (upper house), Abdelkader Bensalah, assumed the charge of Head of State for a maximum period of 90 days, according to Article 102 of the Constitution. This friday, hundreds of citizens began, from the first hour of Friday, April 12, demonstrations in the heart of the capital, despite a monster security device. Deployed since yesterday, the security apparatus erected by the national security services has not been able to prevent hundreds of demonstrators from occupying the place of the Grand Post of Algiers, as well as the famous place Maurice Audin. Protesters chanted slogans against, mainly, the installation of Abdelkader Bensalah as Head of State for a period of 90 days. They also claim the departure of the government of Noureddine Bedoui. The supposed French interference in the internal affairs of the country is also denounced. Like the last Fridays, Act VIII of the popular anti-power movement is marked by the presence of citizens from several wilayas of the country. 1:20 pm: Several vehicles of the riot squad, including one equipped with a water cannon, deployed the place Audin. 12h00: At noon, they are already thousands the Great Post of Algiers. A compact crowd manifest and chant anti-power slogans. 11:20: In Algiers, the anti-riot forces withdraw by saluting the demonstrators. The slogan “Djeich (army), Chaâb (people), Khawa Khawa (are brothers)! Sounded. 10:50 am: The police device retreats from the main entrance of the Main Post, yielding to hundreds of demonstrators. 10:20 am: Volunteer first aiders provide first aid to their colleague, in a moving image of solidarity. 10:10: In an image reflecting the peaceful nature of the demonstrations, a citizen greets and kisses police officers at the Grand Post. 10:00 am: An unusual security device deployed in front of the Grande Post in Algiers. Hundreds of elements of the anti-riot units deployed. Boudouaou to prevent hundreds of motorists to reach the capital. this Friday, braving a monster security device. Algerian Parliament Meets on Tuesday, April 9, 2019, to Declare its Speaker as a Deputy President, who is charged with organizing presidential elections within 90 days. This is the constitutional procedure after the resignation of the ailing president, Abdul Aziz Boutefliqa. يجتمع البرلمان الجزائري بغرفتيه، المجلس الشعبي الوطني ومجلس الأمة الثلاثاء المقبل، لإعلان شغور منصب رئيس الجمهورية وتعيين رئيس مجلس الأمة عبد القادر بن صالح رئيسا للدولة خلفا لعبد العزيز بوتفليقة المستقيل في الثاني من أبريل/نيسان، بحسب ما أفاد مسؤول في مجلس الأمة. أعلن البرلمان الجزائري عن تاريخ عقد جلسة تنصيب رئيس مجلس الأمة عبد القادر بن صالح رئيسا للدولة لمدة أقصاها 90 يوما كما ينص الدستور الجزائري. وسيجتمع البرلمان الجزائري بغرفتيه، المجلس الشعبي الوطني ومجلس الأمة الثلاثاء المقبل، لإعلان شغور منصب رئيس الجمهورية خلفا لعبد العزيز بوتفليقة المستقيل في الثاني من أبريل/نيسان، بحسب ما أفاد مدير الاتصال بمجلس الأمة سليم رباحي . وأضاف المتحدث "وقبل ذلك تجتمع الأحد لجنة تحضير النظام الداخلي لجلسة البرلمان، الذي يتم التصويت عليه خلال اجتماع الثلاثاء قبل تعيين رئيس الدولة". وتنص المادة 102 من الدستور الجزائري على "وجوب اجتماع البرلمان" بعد ان يبلّغه المجلس الدستوري بـ"الشغور النهائي لرئاسة الجمهورية"، ويتولى رئيس مجلس الأمة رئاسة الدولة بالنيابة، ويعمل على أن تجري الانتخابات الرئاسية خلال ثلاثة أشهر، ولا يحق له الترشح فيها. The offices of People’s National Assembly and Council of the Nation will meet, Thursday, at the Council’s headquarters to prepare the meeting of the Parliament, in accordance with Article 102 of the Constitution, following the permanent vacancy of the presidency of the Republic ascertained, Wednesday, by the Constitutional Council. The Constitutional Council which had ascertained, Wednesday, the permanent vacancy of the Presidency of the Republic, immediately communicated the act of declaration of vacancy to the Parliament which will meet de jure according to Article 102 of the Constitution. “The permanent vacancy of the presidency of the Republic is ascertained in accordance with Article 102 paragraph 4, of the Constitution. The declaration act of the permanent vacancy of the presidency of the Republic was communicated today, 27 Rajab 1440 corresponding to 3 April 2019, to Parliament in line with Article 102, paragraph 5, of the Constitution,” the Constitutional Council said in a statement. The Speaker of the Algerian Parliament (Abdul Qadir Bin Salih) assumes the charge of Head of State for a maximum period of sixty (90) days, during which presidential elections are organized. The Head of State, thus designated, cannot be candidate to the Presidency of the Republic,” according to the same article of the constitution. Abdelaziz Bouteflika officially notified, Tuesday, the president of the Constitutional Council his decision to end his mandate as President of the Republic. 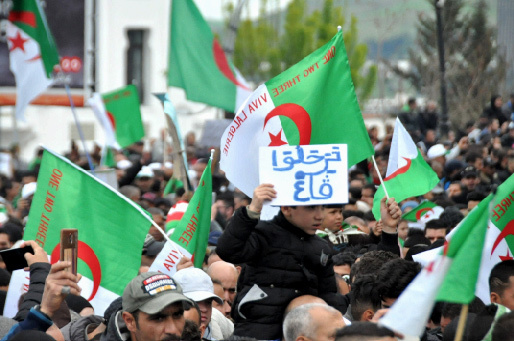 Algeria – This Friday, April, 5th, marks the 7th Act of anti-regime demonstrations. After three contests against the candidacy of Abdelaziz Bouteflika for a fifth presidential term, the head of state responded favorably by giving up his candidacy and postponing indefinitely the presidential election that was scheduled for April 18. The sixth act of the “Hirak” is marked above all by an unexpected position of the National People’s Army, announced by the Chief of Staff, Lieutenant-General Ahmed Gaïd Salah, who called for the application of the Article 102 of the Constitution, dismissing the President of the Republic on the grounds of illness. Later, the outgoing President Bouteflika officially notified to president of the Constitutional Council his decision to end his mandate as President of the Republic. Today’s protests are marked by a strong presence of the retirees of the National People’s Army (ANP). Wearing their military fatigues, caps and berets, army retirees, most of whom served during the dark decade, came to the capital to take part in demonstrations calling for a change of regime. 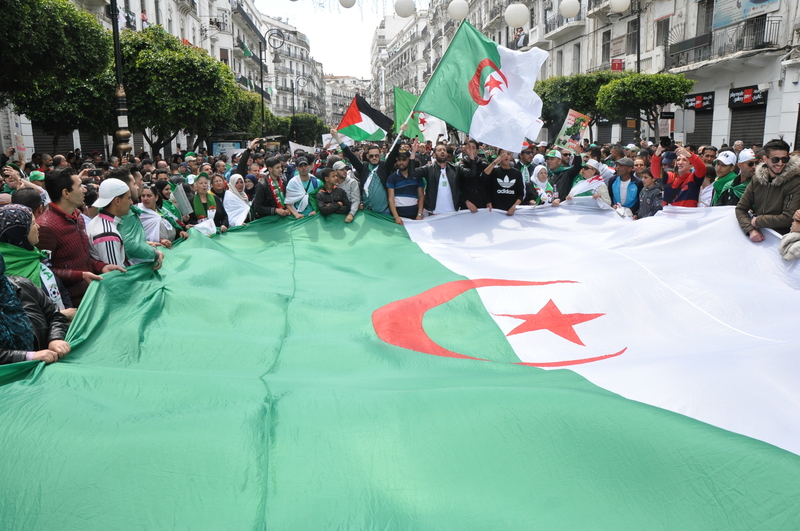 They sang patriotic songs, but also slogans in favor of the popular movement and the former President of the Republic, Liamine Zeroual. The Chief of the Algerian intelligence, Major-General Athmane Tartag, aka Bachir, was dismissed, learned ALG24 from reliable source. Appointed in 2015 at the head of the new intelligence corps, the Directorate of Security Services (DSS), after the dismantling of the DRS and the dismissal of General Toufik, Bachir Tartag was dismissed, said, this Friday, ALG24, confirming information from Beur TV. 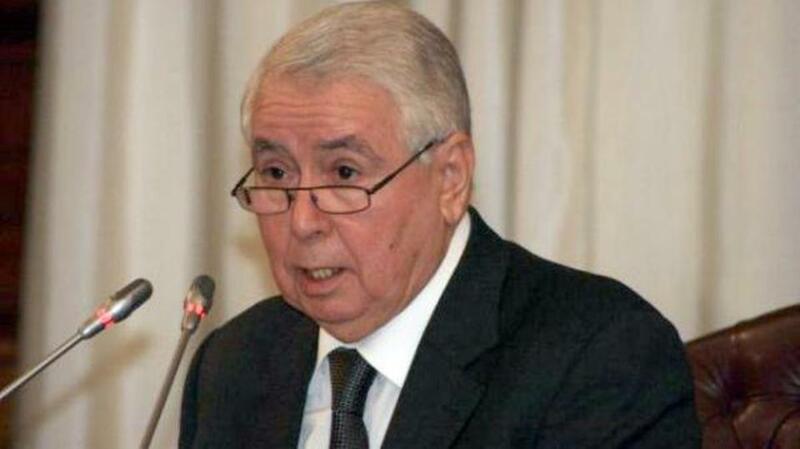 ALG24 has learned that Bachir Tartag was dismissed by a Presidential Decree signed yesterday, Thursday, April 4, by the President of the Republic Abdelaziz Bouteflika. The latter is still authorized to sign presidential decrees, since the Parliament has not yet met to appoint the Speaker of the Council of the Nation as Head of State. Algeria – Intelligence services have become, once again, subsidiary of Ministry of National Defense, announced Ennaher TV. In the same vein, the Chief of the Algerian intelligence, Major-General Athmane Tartag, aka Bachir, was dismissed, learned ALG24 from reliable source. The Lieutenant General Ahmed Gaïd Salah, Deputy Minister of National Defence and Chief of Staff of the National People's Army (ANP), said on Thursday that "the country that enjoys peace and is optimistic about the present and future of its children is a country that has a powerful Army," said a statement from the MDN. The Lieutenant General Ahmed Gaïd Salah, Deputy Minister of National Defence and Chief of Staff of the National People's Army (ANP), said on Thursday that "the country that enjoys peace and is optimistic about the present and future of its children is a country that has a powerful Army," said a statement from the MDN.In the wake of new solution to the political crisis the opinions and the positions of the political class about the solutions likely to end the crisis in Algeria, no matter how diverse, all agree on the need for the preservation of the country’s unity and stability. The Army “will firmly and resolutely face significant challenges in accordance with the Constitution,” stressed Wednesday Lieutenant General Ahmed Gaïd Salah, Deputy Minister of the National Defence, Chief of Staff of the People’s National Army (ANP). The political parties had divergent reactions in the aftermath of the call launched Tuesday by Lieutenant General Ahmed Gaïd Salah, Deputy Minister of the National Defence, Chief of Staff of the People’s National Army (ANP), for the application of the article 102 of the Constitution as solution to the current crisis in the country. Deputy Minister for National Defense and Chief of Staff of the People’s National Army (ANP), Ahmed Gaid Salah said Tuesday that the solution to the current political crisis lies in the implementation of Article 102 of the Constitution, the Minsitry of National Defence announced in a communiqué.